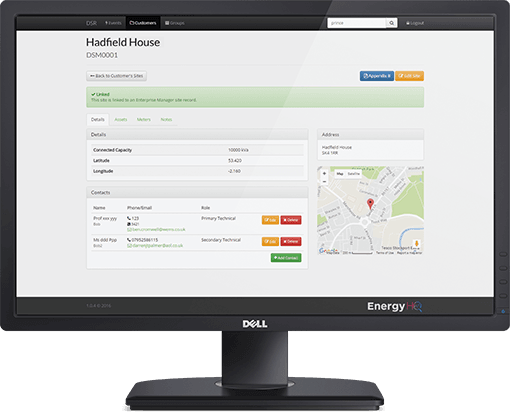 Our demand side response system, developed in partnership with WEMS for npower will change the way DSR initiatives are used throughout the UK. Our in-house design team have spent the last two years working closely with npower and the development team at WEMS. This close working partnership has enabled us to produce a bespoke platform to meet the evolving challenges of balancing electricity demand across the National Grid. The npower demand side response solution is a great example of the Internet of Things being implemented in a manner that actually delivers real-world commercial benefit. Looking for a DSR solution? Demand Side Response can be quite a prescriptive thing to implement. It’s probably best that we have a chat on the phone, or in person. Drop us a line using our contact form, and one of our guys will be in touch. "We are very happy with the project, not just because we are achieving our desired outcomes, but with the service provided by Aimteq." "Aimteq installed the WEMS system and I have seen my energy consumption drop by over 40%. If the system gets overridden, Aimteq work with our sites to resolve the problem and turn the system back to auto control. This maintains our environmental conditions and enhances our savings." "For us, technology must be a safe investment, must not affect the customer experience in our fitness centres, and must go on in the background so as not to cause distraction or disruption. For these reasons, Aimteq’s installation of a wireless solution such as the WEMS one made perfect sense." "We have used Aimteq on many sensitive government buildings and projects. At these locations, discretion, along with sensitivity towards the environment and the building occupants is paramount. As such, disruption in these areas must be kept to a minimum. We have found Aimteq to be a progressive company in their approach to not only building controls, but in the suggestion and implementation of energy improvements to building controls." "When Colt started to expand beyond London in the late 1990s we needed some form of building management technology to support our remote sites and deliver alarms to a central server. Today we have scores of sites and Aimteq has been an excellent support partner throughout our evolution. We have almost day-to-day interaction with Aimteq and regular reviews with their team." "Matalan has made the commitment to have the WEMS system installed by Aimteq in all our retail outlets. The installed stores have shown a considerable reduction in energy consumption of circa 18% and this is reflected in our energy bill which has decreased dramatically since implementation." "Over the 61 sites we’ve seen a 32.92% drop in our consumption, which translates to a considerable saving on our energy spend and correlates well with our sustainability policy. Further to that, the experience dealing with Aimteq was seamless from start to finish." "The bureau offers fantastic customer service, and importantly, is operates 24/7; longer than any of the bureau services we researched. We get through to a real person straight away and changes are made quickly." 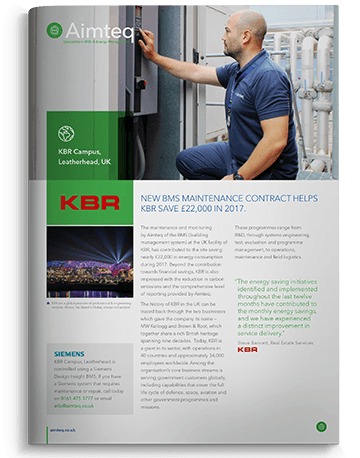 Maintenance services and energy saving initiatives delivered by Aimteq have helped KBR save £22,000 in the first year of the contract on their Siemens Desigo Insight BMS.